Where is this room? I like it-that said-I am not a fan of the Lattice in any spot except out of doors. Take away the ferns and lattice,rug(which I think must have been quite modern in the day) and it works. What struck me in the enlargement is the sofa fabric-appearing lightweight and the neat and trim tiered table to the side. Still in all a great departure from the typical rooms-what? conservatoried ones of the time. It looks just like something Diamond and Baratta would do. From what I have seen which is precious little top design is the last place to find good design. Love these past to present posts-does the room hold up- I know Elsie had days when the rinse didn't wash-but I don't think this is one. I think it may have been pretty. Its a highly romantic look almost like some of the 80s work of Denning and Forcade when they got all 19th century. I imagine it was full of color and that many of the pieces where old – might it looked sort of Bunny Williams-ish? All those layers, eclecticism, stuff, color, detail, expense- how bad could it have looked? But truly not my taste at all! I would mush prefer the other Bunny's take on the french garden look…Bunny Melon. 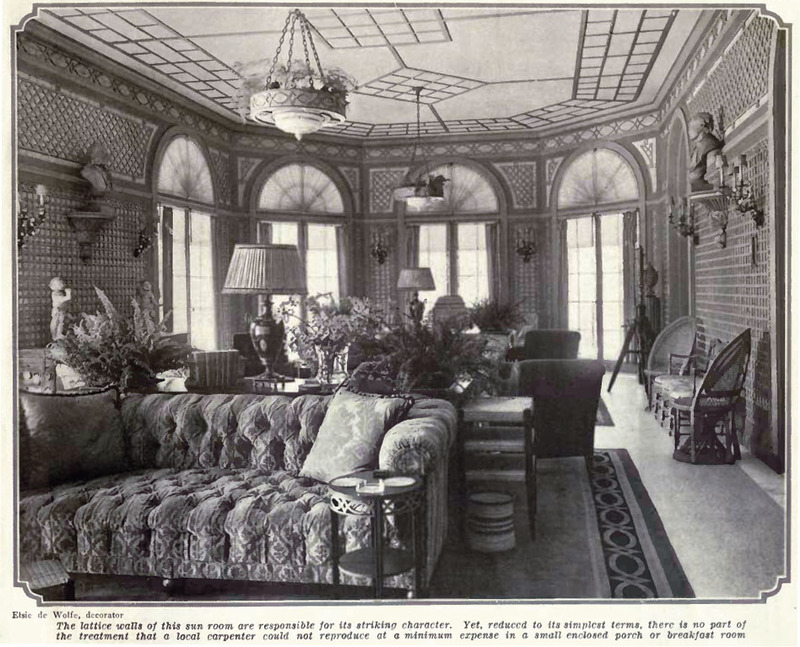 interesting though when you look at the designs of rooms from the past in black and white — your eye tends to look at the forms first, then the positive space against the negative, balance and harmony of the shapes… if we saw this in color we might judge is differently. but right now, good call DED, looking like a very bad hair day indeed.the room is so fussy. LOL, it looks as if this one is getting some conversation going. Gaye: I don't know where the room was, unfortunately.I like many of the things in the room—would kill for those busts, for example. I agree about Top Design. That's why I made the wise crack.I don't like the ceiling—it doesn't relate well to the walls, the busts are very oddly placed, don't like the matchy matchy. bordersAnonymous 1: I agree. Denning and Fourcade came to mind for me too, and I also much prefer the Bunny Mellon look.Soodie, I agree we might feel differently in color, but black and white doesn't lie about proportions and detail, and definitely some problems here. Thanks for supporting my vote.Yvonne, I ADORE Dorothy Draper—the first time I ever was in the lobby she did for Hampshire House, I was about as happy as a boy can get. Really amazing.Anonymous 2: I did see the post of the other room, and found more in my own clipping files which I will post soon. Someone mentioned that Jansen actually did that room, however. Little Augury, Diamond and Baratta did do a trellis room, in blue and white–really beautiful. I saw it in a lecture they gave at The New York School of Interior Design. Maybe you saw it published? I like trellis. I don't mind the ceiling. The designer used 2 zones formed by the 2 separate carpets and picked up the border motif from the walls rather than echo the ceiling in the carpet ala Robert Adam. It's hard for me to really tell what's going on with the furniture. I wish there was another photograph. I am a fan of 'stuff' and the old English house look, so clutter is not clutter to me, it's cozy. And I love the tufted sofa! For a more modern take on this room you would make it one zone with a looser more open furniture arrangement,update the fabrics, add some great linen prints from China Seas, but honestly I don't see much in there that couldn't be used today, with a little tweaking.